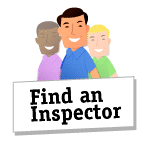 I’m not a building inspector, but as a former building contractor and a widely published home-improvement writer, I’m often asked by friends and acquaintances to assess their homes and suggest the best ways to address whatever issues there might be. My friend Tony—a person driven chiefly by a desire to responsibly fulfill his duties as a family man—recently presented me with an interesting case. 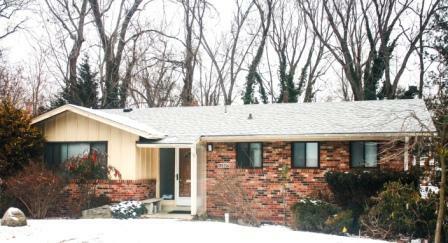 Tony and his wife, Karen, had been given stewardship of a 1950s rambler in an upscale suburb of Washington, D.C., that belongs to her 85-year-old father. It’s modest by any measure except for its value—$450,000 to $500,000 in today’s market—and in need of some TLC. The father is alive and well but living elsewhere. He doesn’t need to recover equity or earn income from the house—it’ll one day be part of his legacy to his daughter and grandkids—but he doesn’t want the headaches of caring for it, either. That falls to Tony, and he’s asked me what he needs to do to preserve the value of the house. For the time being, Tony is letting one of his daughters—a recent university graduate—live in the house with friends until she gets a footing in her career (and with a B.A. in Cultural Anthropology, it’s anyone’s guess as to how long that will take). The young woman had mentioned more than once during this unusually cold D.C. winter that the house is chilly. Tony’s focus is on the windows. Most of them are horizontal sliders. The living room also features two sliding-glass doors—a kind of glass wall that overlooks a rustic backyard. Should he replace any or all of them? During my walk-through, I encountered 12 single-glazed, aluminum-frame horizontal sliders of 1970s vintage—not the best from a comfort or energy standpoint, but their factory finish is still in pretty good shape, and they’re fitted with screens and storm sashes. The exterior caulking around the frames is fairly worn out and cracking. On my way inside, I noticed that the soffit panels at the eaves have all been taken off. I saw that the underside of the sheathing is water-stained. I’ll bet there was leaking from ice damming (thick ridges of ice along the eaves), and it’s ruined the soffits. Tony’s already had a new asphalt shingle roof put on. I hope they flashed the eaves against leakage caused by ice dams. 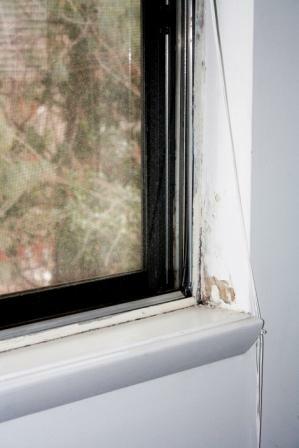 Looking at the windows from inside, I found some evidence of moisture infiltration around the jambs and sills. Was the source the damaged caulk? Inadequate flashing in the original installation? Leaks from ice dams? Better windows are available these days. In our market, it would probably cost him about $1,000 apiece to replace the sliders with vinyl low-E, gas-filled units. There’s also a big combination unit with fixed glass and double-hungs on the front of the house; replacement would cost about $2,000. But would replacement windows—properly installed—actually improve comfort, and preserve or add value to the house? While mulling that over, I went into the living room to look at the sliding glass patio doors. They’re much newer than the other windows, as they have aluminum frames and insulating glass. They’re in great shape, but the sheer size of the glazed area explains why the house is so chilly in winter. And there’s another issue: the living room is above a walk-out basement, so the door sills sit about 9 feet above the grade of the stone patio below, which is a code violation. Tony would never be able to sell or rent out the house without addressing that problem. The Remodeling Magazine’s 2015 Cost vs. Value Report states that the return on resale for vinyl replacement windows in the South Atlantic region area is about 60%. 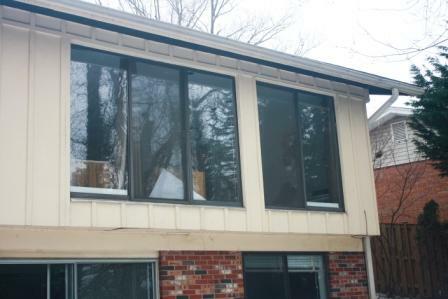 It wouldn’t make much sense to replace the horizontal sliding windows throughout the house. While they’re old and only single-glazed, they’re fitted with storm sashes, so their energy performance is roughly comparable to double-paned glazing. I have concerns about the evidence of moisture infiltration around the windows, but my guess is that the new roof may have corrected the problem. I would, however, renew the exterior caulking, and fill and paint the interior finished openings, as well as keep an eye on them to see whether evidence of moisture intrusion returns. 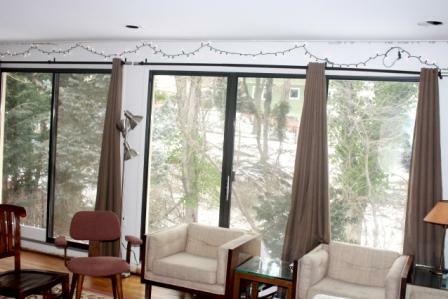 It wouldn’t make any sense to replace the sliding glass doors in the living room with new ones of comparable size. It would cost about $5,000 to upgrade them with doors with gas-filled glazing, and that would improve the energy performance from R-2 to R-4, but it would result in only a very small improvement in comfort, and probably no reduction in energy costs. Plus, he’d still have the code issue to deal with. To simply remove the violation, install approved guardrails at least 48 inches high, and align them with the sliding door sills. To remove the violation and improve comfort, take out the sliding glass patio doors and redesign the wall by reconstructing it with better insulation and smaller windows. To remove the violation and add value to the house, add a deck off the living room. The Cost vs. Value Report says that in the Washington, D.C., area, a deck addition returns almost 96% of its cost at resale. Finally, I told Tony, I’d invest in thermal drapes for the living room and elsewhere to help keep his college grad and her roommates more comfy. Author Michael Chotiner is a DIY expert who writes about home improvement projects for The Home Depot. Michael is a career carpenter and has owned and managed his own construction business, and windows are one of his areas of expertise. Visit The Home Depot online to see their full range of windows here.